The Suspicious Safari (led by that shifty foreigner Pierre LeMembre) skulked suspiciously, except when Mustafa Lataganz got temporarily lost in the jungle. The mercenary merchant sailors also skulked and took potshots at nearly every other faction. The British left the table with one of the major Clues; the Suspicious Safari left with the other; the Reds got to replace their lost grunt with a new one. (All results from Encounter Markers triggered during the game, as was Mustafa’s getting lost earlier). We called Act One when both Clue-winning factions made it off the table, just over an hour after we got started. Act Two, “The Mesa of Fire”, was a search over a desert mesa for the hidden entrances to a Lost Tomb full of treasure, including the famous Amulet of Fire. The Red Air Pirates began the festivities by blowing up the White Russian’s car; Pierre LeMembre found a scorpion; and nearly everyone shot at the Reds – to very little result. 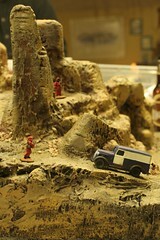 The mercenary sailors used their speeding truck to ram the burning wreckage of the White’s car off a cliff to clear the road to the top of the mesa, and displayed amazing (lucky!) driving by not going off a cliff themselves. They did punch at least one Red Air Pirate off a cliff, though. One particular cliff had a pretty steady rain of characters falling over it, actually. Once the tomb had been opened, the White Russians almost immediately backstabbed the British, with Col. Plotzenov attempting to shoot Lt. Smoething-Aefwel in the back. The British were further distracted by a collapsing floor; Mustafa got lost again (underground, this time) and Pierre had the ceiling fall on him. In the end, by the closest of margins, the British wound up finding the Amulet of Fire first, winning the game. Pulp, in other words, was committed. So were terribly bad jokes, mostly thinly disguised as character and place names. I managed not to take a single picture, alas. Sorry. I know I fail. Given that this was the first-ever public playing of “Amulet of Fire”, it worked amazingly well. Two full scenes with three settings (jungle, mesa surface, tomb inside the mesa), five players and a dozen characters involved, including vehicles in both settings, and we got done the entire story, to a satisfactory conclusion of both Acts, in just over three hours. I’d started setup around twenty to two; play began just past 2 PM; Act One concluded just past 3 PM, we took a ten minute caffeine-and-bathroom break, then Act Two ended in the black and dust-filled tomb around ten past five, leaving me plenty of time to pack up before the next block began. A few things are going to be tweaked; one or two Encounters edited and possibly a few added; I’ve incorporated some very good feedback from my players; none of the factions need major rebalancing. Not bad for a completely new scenario that (to be honest) I had never playtested all the way through before Saturday afternoon! 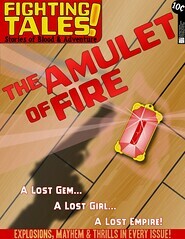 “Amulet of Fire” has it’s next major public outing at Trumpeter Salute in early April – see you in Vancouver!